B'resheet/Genesis 31:3 Return to the land of your fathers and your birth, and I will be with you. HaShem to Ya'akov, telling him that it was time for him to leave his period of temporary exile - sent by his father Yitz'khak to Padan Aram and the house of his uncle, Laban, to get a wife - and return to the Land of Israel. It could be condensed into two words: Go Home! The first word, is the Qal ms imperative of the root verb meaning to turn or to return; there is no , 'please', or other indication that this is anything other than a definite instruction. Certainly, it does give Ya'akov permission to do what he had perhaps for some little while - given the deteriorating relationships with Laban and his family - been thinking was an approaching necessity, but it goes further: Ya'akov is being commanded to return. It is interesting that Ya'akov is the first of the patriarchs of whom this could be said: not only was he born there, but the Land of Israel was the land of his father Yitz'khak and his grandfather, Avraham. Rashi puts these words in HaShem's mouth: "There I will be with you, but as long as you are associated with the impure one (that is, Laban), it is impossible to rest My Divine Presence upon you." There, but not here, because your association with Laban makes you impure, so that My Presence cannot be with you. Rav Sha'ul warns the congregations in Galatia about "sexual immorality, impurity and indecency; involvement with the occult and with drugs; in feuding, fighting, becoming jealous and getting angry; in selfish ambition, factionalism, intrigue and envy; in drunkenness, orgies and things like these" (Galatians 5:19-21, CJB) and says that "those who do such things will have no share in the Kingdom of G-d!" (v. 21, CJB). Some of the things on Sha'ul's list seem quite minor, particularly compared to some of the others, yet Sha'ul says that those who do any of them will not know the Kingdom of G-d.
Sforno focuses on the last phrase of the verse - "And I will be with you" - saying that HaShem means that "no harm befall you during the journey". Nahum Sarna adds that "any lingering doubts as to his proper course of action are soon dispelled by G-d's command and His reassurance of protection." These words must have been comforting to Ya'akov, remembering twenty years before at Bethel when on the night he left home, headed out to Padan Aram, HaShem told him, "Remember, I am with you: I will protect you wherever you go and will bring you back to this land" (28:15a, JPS). HaShem is doing what he said He would do: "I will not leave you until I have done what I have promised you" (v. 15b, JPS). While the promises are still far from complete, it is reassuring that HaShem is still there and will stay with him during his journey back to the Land, whatever that may involve. Yeshua too promised his disciples that He would never leave them (Matthew 28:20) or leave them as orphans (John 14:18). 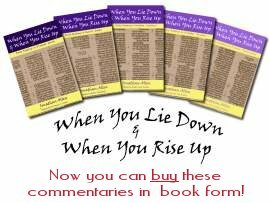 The next turn in the story belongs to the ancient rabbis whose sayings are preserved in the Midrash. Starting from the verse, "I cry to You, O L-RD; I say, 'You are my refuge, all I have in the land of the living'" (Psalm 142:6, JPS), they "where is the land of the living?" Is it the region of Tyre, where everything is plentiful and cheap? No, Resh Lakish in the name of Bar Kappara used the verse "YHVH ... who gave breath to the people upon it and life to those who walk thereon" (Isaiah 42:5), says that it is "the land whose dead will be the first to be resurrected in the days of the Messiah" (B'resheet Rabbah 74:1). In other words, "the land of the living" is the Land of Israel, the land of the resurrection, where Messiah will come. We know that in His first coming, Yeshua came to Bethlehem - "And you, O Bethlehem of Ephrath, least among the clans of Judah, from you one shall come forth to rule Israel for Me -- One whose origin is from of old, from ancient times" (Micah 5:1, JPS), fulfilled in "Now after Yeshua was born in Bethlehem of Judea in the days of Herod the king, behold, wise men from the east came to Jerusalem" (Matthew 2:1). Similarly, we know that at His second coming, He will come to Jerusalem: "On that day, He will set His feet on the Mount of Olives, near Jerusalem on the east; and the Mount of Olives shall split across from east to west ... and the L-RD my G-d, with all the holy beings, will come to you" (Zechariah 14:4-5, JPS), affirmed by the angels at Yeshua's ascension - "This Yeshua, who has been taken away from you into heaven, will come back to you in just the same way as you saw Him go into heaven" (Acts 1:11) - but still to happen. That brings us neatly to the question of time. Ya'akov was told to return to the Land at the right time; Yeshua will return when the time has come. Hebrew has a number of words for time: , a season or interval of time; , an appointed time or appointment; , time, now. Two of these are found in Solomon's famous poem starting: , "There is a season for everything, a time for every occupation under heaven" (Ecclesiastes 3:1, NJB). Nothing in G-d's economy happens out of time, but always in time. For example, Avraham is told that his descendants will be four generations in Egypt "They shall return here in the fourth generation, for the iniquity of the Amorites is not yet complete" (B'resheet 15:16, JPS). In Daniel's enigmatic vision about times, he is told, "Seventy weeks are decreed about your people and your holy city, to finish the transgression, to put an end to sin, and to atone for iniquity, to bring in everlasting righteousness, to seal both vision and prophet, and to anoint a most holy place" (Daniel 9:24, ESV). These are both specific times of a known duration. But there was also a time for G-d's most important purpose under heaven: "when the fullness of time had come, G-d sent forth His Son, born of woman" (Galatians 4:4, ESV). Human gestation is usually around 40 weeks, give or take, and the baby comes when it is ready. There was a chosen day, at the end of Mary's pregnancy, after Joseph had gone with her to Bethlehem, as Luke tells us, for "the first registration when Quirinius was governor of Syria" (Luke 2:2, ESV)1, around the festival of Sukkot, when the shepherds were still out in the fields at night with their sheep, for Yeshua to be born. Eight days later He was circumcised according to tradition and the Torah; and on the thirty-third day, as the first-born son He was redeemed at the Temple in Jerusalem when his parents went up for the purification rites. There, the family was met by Simeon, a righteous man, called into the Temple on that precise day to see the Child who was to be G-d's salvation for Israel and the nation, for G-d had promised Simeon that he would not die until he had seen the Messiah. So too was the encounter with Anna, an eighty-four year old woman, waiting - with prayers and fasting - in the Temple for G-d's redemption of Jerusalem. Coincidence or plan? Nothing less than G-d's perfect timing both for the individuals concerned and for Yeshua who arrived at the perfect time for the Roman empire to carry the gospel around the known world and provide the perfect foil for G-d's message: Caesar is lord of all? No! Yeshua is L-rd of All!! G-d's timing issues remain in force today. There is still a time for every purpose under heaven. Isaiah prophesied, "Seek the L-RD while He may be found; call upon Him while He is near; let the wicked forsake his way, and the unrighteous man his thoughts; let him return to the L-RD, that He may have compassion on him, and to our G-d, for He will abundantly pardon" (Isaiah 55:6-7, ESV). Here we have more 'return' instructions, this time to those who are estranged from G-d by their actions, choices and attitudes. Yeshua said at Zaccheus' house, when Zaccheus repented of his sin and turned to G-d: "Today salvation has come to this house, because he, too, is a son of Abraham" (Luke 19:9, ESV). Not just any day, but today, this very day. The Ruach continues to speak to people's hearts in our day, calling them to return to G-d, to throw themselves on His mercy and find grace and forgiveness. This invitation is now: "Today, if you hear His voice, do not harden your hearts as in the rebellion, on the day of testing in the wilderness" (Hebrews 3:7-8, ESV). Rav Sha'ul told the Corinthians, "As He said, 'At the time of My favour I have answered you; on the day of salvation I have helped you'; well, now is the real time of favour, now the day of salvation is here" (2 Corinthians 6:2, NJB). Relationship with G-d can only be in the present - it cannot be in the past and may never happen if you leave it until the future. 1. - There was a second census during Quirinius' time as governor, in the year 7 CE. Application: Do you know G-d in the present, or is He just an image in the past or a spectre in the future? Today we need to hear the words that Ya'akov heard: It's time to come home, and I will be with you!